The year 2013 was very important for WCF for many reasons, not the least of which are partnerships, membership and program impact in West Africa, Latin America and Southeast Asia. Partnerships: In 2013, WCF welcomed new partnerships with the Ford Foundation (Indonesia), Nigeria’s Federal Ministry of Agriculture, and the Walmart Foundation (West Africa). Collectively, these new partners are helping us build capacity in local institutions, expand farmer training and improve our outreach to women farmers. Our existing partnerships with the U.S. Agency for International Development, U.S. Department of Agriculture and the Bill & Melinda Gates Foundation will enable us to reach thousands more cocoa farmers and their families. Membership: WCF is a membership-based organization, with long-term support since 2000 from companies in the cocoa value chain. This year, we welcomed 12 new members, which individually and collectively greatly help us to expand the diversity and level of expertise in our membership. The new members in 2013 were Bourbon (Japan); Buhler (Switzerland); Chocolaterie De Schutter (Belgium); Conacado (Dominican Republic); Confiseur Laederach (Switzerland); Daito Cacao (Japan); Federated Commodities (Ghana); GSR (Italy); Marks & Spencer (United Kingdom); Mead Johnson (United States); OCP (Morocco); and Rogers’ Chocolates (Canada). WCF now proudly counts 114 member companies from the Americas, Europe, Asia, and Africa. We also welcomed senior level participation in WCF’s governance, with more of an emphasis on key drivers that we feel will make the greatest impact in improving the livelihoods of cocoa farmers. Program Impact: WCF has placed particular attention on working with our members, producing country governments, and implementing partners to develop standardized ways of measuring program impact at the community level. CocoaMAP is the centerpiece of this effort and we look forward to it providing aggregated information on economic, social and environmental conditions at the farm level. Our first report from CocoaMAP will be issued in 2014. With 2013 now behind us, I want to take this opportunity to thank you for the support and friendship that you provided WCF during the past year. We look forward to ongoing collaborations in 2014 and beyond. In promoting the development of cocoa-growing communities, sustainability has become a tenant of WCF’s work.When cocoa farmers have many resources and opportunities to leverage, they can better ensure their family’s livelihoods and safeguard future opportunities, for example by investing in their farm or their children’s education. 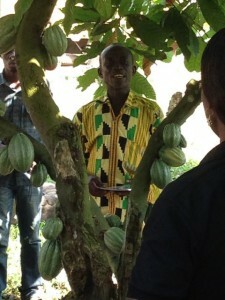 Understanding the role that gender and food crops play in cocoa-growing households is key to promoting sustainability. Women are key economic factors in the cocoa value chain and are also involved in other activities that contribute to household income and food security. With the Cocoa Livelihood Program (CLP), WCF is providing agricultural services to both women and men to improve their food crop production, while addressing the specific challenges that women face in agriculture to improve farmer resiliency. Women produce the bulk of food crops in West Africa, the majority of which are produced in small scale and for household consumption. Greater opportunities exist to increase household income with higher food crop production and improved market access for women. Yet they face a number of constraints, including land tenure issues, difficulties in accessing agricultural inputs, minimal production training, and a lack of farmer organizations to assist with buying and selling. Their numerous responsibilities in the household limit the time they can invest on the farm. 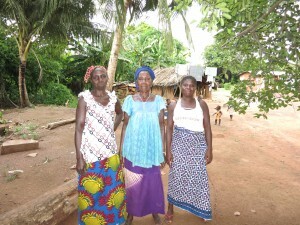 For example, Yvonne Djomenan is a small-scale farmer living near Divo, Côte d’Ivoire. She farms a plot of land that her husband has loaned her, and also works on her husband’s cocoa farm. During harvest time, she has difficulty keeping up with all of her responsibilities, including tending to her own vegetable patch, helping with the cocoa harvest, caring for her children, cooking daily meals, collecting water and firewood, and cleaning her home. She would like to grow more cassava, but has no land or time to dedicate to an additional crop. WCF and the Walmart Foundation joined forces in 2013 to provide better services to women like Yvonne who live in cocoa growing communities. Through support provided by the Walmart Foundation and the Bill and Melinda Gates Foundation, WCF will expand farmer training with a focus on women’s empowerment, with the goal of increasing cocoa productivity on farms as a means of raising women’s income levels and enhancing women’s decision making ability on investment and consumption choices. In this video, WCF’s President, Bill Guyton, and Chairman, Nicko Debenham, discuss accomplishments and their vision for the future of the Foundation. VIEW FULL VIDEO HERE or click the image below. Agricultural productivity varies around the world, partly due to slow adoption of modern agricultural technologies and management systems. Agricultural extension services seek to transmit research-based knowledge to facilitate adoption of improved practices that ultimately benefit farmers. However, the number of in-field agents is often insufficient to meet farmer information needs. Programs like CocoaLink find innovative, low-cost ways to provide additional methods of distributing of information that support traditional agricultural extension to rural farmers. When CocoaLink Ghana first launched in 2011, studies on mobile and digital technology for rural agriculture development were limited, but promising. Since then additional studies have produced evidence that supports the feasibility and impact potential of using mobile phone-based innovations. They are showing that programs like CocoaLink increase rates of adoption for good agricultural practices, help improve productivity, and increase farmer income. For example, the 2008 research study “Does Digital Divide or Provide” (Aker) suggests that the introduction of mobile phones enabled information access that improved consumer and trader welfare in Niger. The technology allowed traders to search and sell grain across a range of regions and in more markets. This ultimately lowered price variation for better pricing during food-insecure periods. The 2011 paper “Crop Nutrient Management Decision Support System: India” (Raj, et al) showed that mobile phones reach the “last mile” of marginalized farmers to improve their soil quality. The researchers demonstrate that tailored soil nutrition information resulted in application of practices that increased participants’ net income by 15 percent. Importantly, they found that embedding the technology in local institutions provided facilitation by intermediaries to boost access and use of the information supplied through the mobile phones. The 2012 impact evaluation “The Value of Advice” (Cole and Nilesh) of a mobile phone-based agricultural extension service in India found that enrolled Indian cotton farmers improved their management practices. The program featured a telephone hotline to call in, ask, and listen to questions posed to agricultural experts as well as timely agricultural text message content. Engaging in the services, despite differences in levels of education among participants, impacted farmer behavior towards applying information generated through the service. Capitalize on penetration rates of mobile technology in rural areas to create two-way information flows. 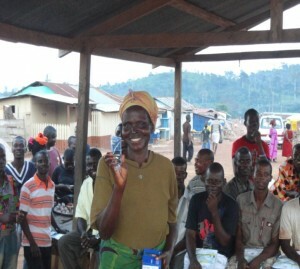 Collaborate with trusted extension infrastructure, such as the Cocobod-identified “lead farmers” and trained community facilitators/agents that CocoaLink connects with. Complement two-way messaging services with education sessions that teach farmers how to use the technology, as CocoaLink does with its network of lead farmers and community facilitators in Ghana. Programs like CocoaLink that reach farmers through mobile technology are demonstrating the importance of using innovative approaches to common problems. Opportunities abound for platforms such as CocoaLink for making lasting impacts for rural agriculture sectors. Black Pod disease caused by Phytophthora species is responsible for global annual yield losses of more than 450,000 tonnes of cocoa and is a serious limiting factor reducing farmers’ productivity and income. To help understand the limitations in current methods of studying the disease and in identifying sources of resistance, and for developing the tools necessary for breeding new and more resistant cocoa varieties, Mondelēz International sponsored a knowledge exchange event for scientists working on black pod disease. 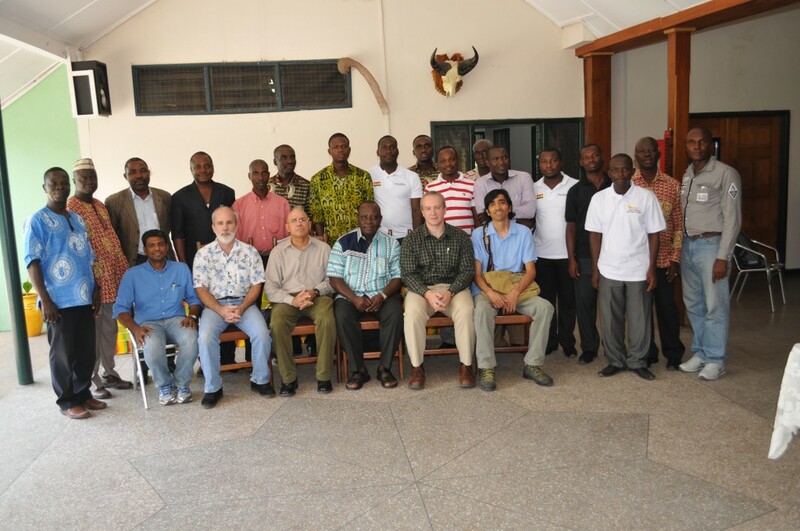 This event was hosted by the Cocoa Research Institute of Ghana and organized by USDA-ARS and CATIE, October 2013 with assistance from WCF. Expert scientists from Ghana, Côte d’Ivoire, Nigeria, Cameroon, and Togo attended as well as representatives from USDA-ARS and the Cocoa Research Centre University of West Indies. A major outcome from the event was agreement on the use of standardized methods for scoring black pod disease resistance using four inoculation tests. It was confirmed that although there are published protocols for conducting these tests, different laboratories and scientists performed the tests in different ways. Variation in the execution of protocols may influence the outcome of the tests. During the one-week event, scientists visited cocoa plots to observe different types of diseases in West Africa and the various stages of their pathological development. This was particularly instructive as symptoms of Phytophthora palmivora and Phytophthora megakarya were observed and visual differentiation between diseases by the two species noted. Other less common fungal diseases, such as warty pod rot and charcoal rot, were also observed. The group shared practical experience on laboratory procedures for isolation, culturing, and inoculation with Phytophthora isolates. Scoring of disease severity allowed the comparison of visual methods with digital image analysis software. The next steps for the group include: the formation of a working group on Phytophthora under the auspices of the International Permanent Working Group for Pests and Diseases (INCOPED); development of standard operating procedures and validation of their robustness and usefulness in predicting field resistance. The working group will aid the development of new disease resistant varieties in two ways: first, through consistent validated tests in each laboratory to identify and distinguish levels of disease resistance for various clones in local and international collections; secondly by allowing the exchange of information between laboratories in a standardized format for the screening of the disease. Through this approach, parental materials could be selected for breeding programs across the whole cocoa community. For more information about Phytophythora disease, visit: http://www.incocoa.org/incoped/phywg_about.php. Report submitted by Nicholas Cryer on behalf of Mondelēz International. The Jaya Mandiri women’s farmer group in Sipakainge Pinrang district, Indonesia, aspired to improve their livelihoods through the creation of a cocoa business, so they began by processing and composting cocoa husks. They were quickly faced with obstacles to building their businesses including gender biases, labor intensive work, market competition and raw material shortages. 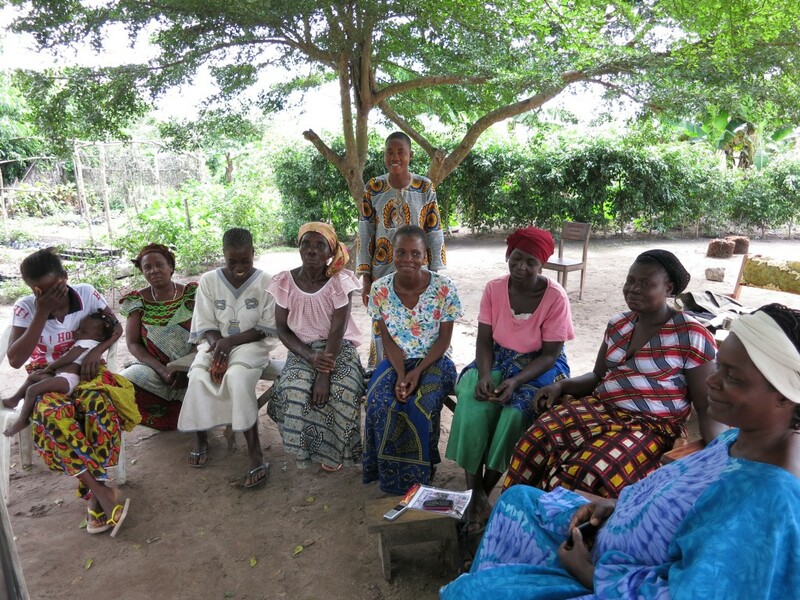 The women’s group realized that they needed to change their strategy to cocoa buying. After making several changes, Jaya Mandiri received a business loan to help expand their business: an achievement in a male-dominated loan market. The 25 members of Jaya Mandiri are involved in cocoa farm pruning, harvesting and post-harvest handling (drying and selling), and are supported by the AMARTA II program. AMARTA II program contributors include World Cocoa Foundation, US Agency for International Development, Armajaro Trading Ltd., Continaf, The Hershey Company, Mars, Incorporated, Mondelēz International and Olam. Though AMARTA II ended in August 2013, activities continue under the Cocoa Innovations Project with support from the WCF members and ACDI/VOCA. After facing obstacles with cocoa husk composting, an idea emerged to set up a cocoa buying unit in one of the member’s houses. The cocoa buying unit purchases wet beans; during the harvest season, many farmers prefer to get cash quickly, selling their wet beans before they have time to dry. Jaya Mandiri weighs, dries, and ferments the beans. With the provision of a solar drier from AMARTA I and AMARTA II, their work is made easier in the rainy season. Once the beans are dried and fermented, the group sells them to exporters at a higher price. Symptoms of witches’ broom disease in cocoa are typified by the emergence of multiple shoots from either young vegetative buds or flower cushions, causing the characteristic witches’ broom structure. Witches’ broom can result in severe yield loss through the depletion of the resources of the tree or direct damage to flower cushions. In severe cases, the disease can cause death of the cocoa tree. The introduction of witches’ broom into Suriname and Trinidad in the early 1900’s resulted in the large scale abandonment of cocoa estates. In 1981, the Cocoa Research Center (CRC) of the University of the West Indies established the International Cocoa Genebank, Trinidad (ICGT), and in 1998, the CRC established a research program on witches’ broom resistance. The research program has continued to this day with support from WCF. The objective of the program is to identify resistance to the witches’ broom disease within the genetic resources held at the ICGT. The research program presently uses a two tiered screening method to identify resistance to witches’ broom in replicated greenhouse trials. During the first stage, the grafted material is subjected to spray inoculation. The genotypes that show no symptoms or attenuated symptoms are screened further using the agar droplet method (a quantitative screening method) to assess the level of resistance. Results from the trials show that resistance is spread across various genetic groups and illustrates a normal distribution. 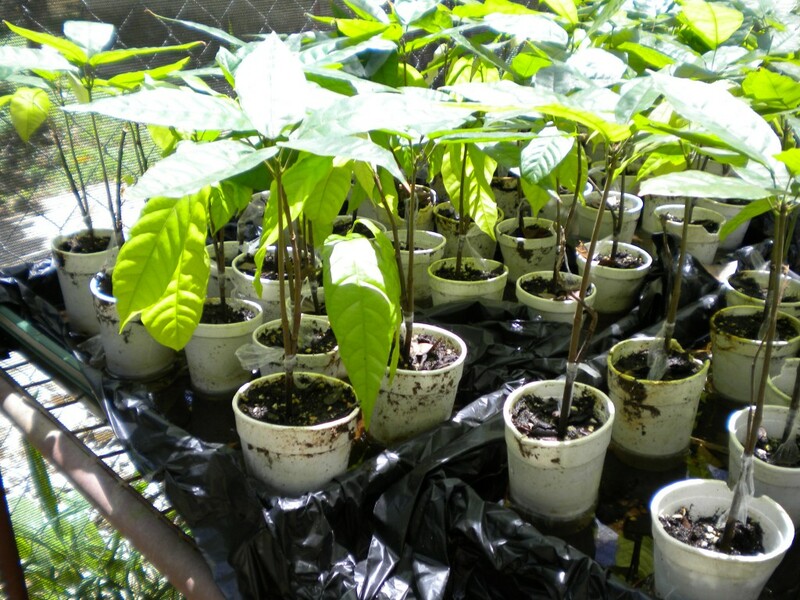 The early cocoa varieties identified as resistant were included in a Common Fund for Commodity funded pre-breeding program, aimed at concentrating the resistant genes. These varieties were planted in the field to generate the second cycle of breeding. The results will be used to carry out genome wide association studies to identify candidate genes and markers to support future breeding programs. A Ghanaian cocoa farmer explains his farming business on Ghana National Farmer’s Day, December 6, 2013. As the sun sets on Côte d’Ivoire, cocoa farmers are coming in from their farms and home to feed their families. Others are coming home from these cocoa farms as well – measurement-and-evaluation professionals, certifiers, and cocoa industry pros who have spent their day in the cocoa forest looking after the sustainability of cocoa farms and cocoa families. In December 2013, WCF CocoaMAP staff were in Côte d’Ivoire and Ghana, West Africa, to develop tools and information needed to support the industry’s progress toward sustainability. The next phase of work on CocoaMAP – WCF’s Cocoa Measurement and Progress Initiative – has begun. In 2013, key industry and civil society leaders came together with WCF to achieve consensus on a carefully prioritized set of Key Performance Indicators (KPIs) for CocoaMAP. WCF ended the year in the field in Africa talking to member companies and program implementers about taking these improved KPIs to the field with improved data collection tools. Members are welcoming the coordination and support WCF is bringing through this collaborative approach to improving cocoa measurement and evaluation. A new web Interface to key performance data, delivering improved information and insights. Offering trust-worthy KPI data management, and secure access for each member company, CocoaMAP holds the promise of both improving cocoa sustainability data and providing the analytical power of aggregating essential information across the cocoa sector, delivering strategic value to businesses working to improve the cocoa value chain. In West Africa, supporting improved data collection will be a key activity throughout the coming seasons, with CocoaMAP data collection tools soon to be in the hands of member companies, trainers, and extension agents eager for this support. 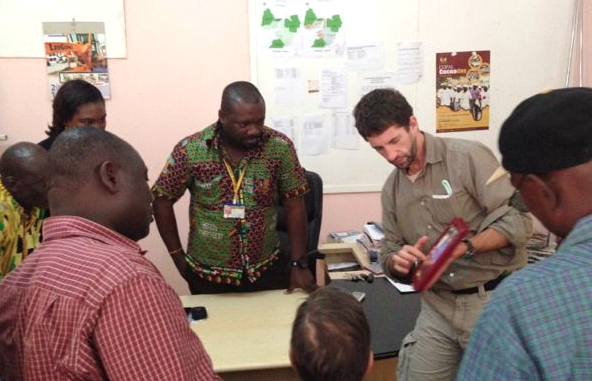 WCF staff Ethan Budiansky gives a lesson on cocoa production technology while touring Ghana’s COCOBOD Seed Production Unit in December 2013. CocoaMAP will help make the industry’s shared learning and collaboration pay off. WCF’s dedicated approach to shared learning and improved information continues to offer a brighter day tomorrow to those hard at work on the cocoa farms of Côte d’Ivoire, and around the world. Since October 2013, WCF has welcomed Buhler, Chocolaterie De Schutter, and Mead Johnson as new members. WCF welcomes new staff member Atheba Mireille (Administrative Assistant, WCF/CLP – Abidjan).